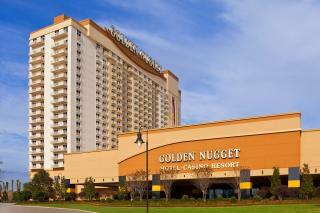 The Golden Nugget Lake Charles is officially open for business! “The opening of the Golden Nugget has been highly anticipated for the region,” said Megan M. Hartman, senior marketing manager for the Lake Charles/Southwest Louisiana Convention & Visitors Bureau. 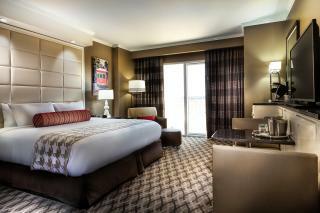 Corner Suite by Landry&apos;s, Inc.
With 740 guest rooms and suites, meeting space, extensive retail outlets, a full-service spa, and an innovative casino floor, the Golden Nugget Lake Charles has truly emphasized the appeal of Southwest Louisiana being a premier resort destination. 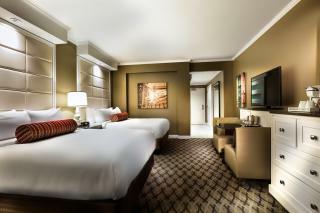 Double Room by Landry&apos;s, Inc.
Foodies will be delighted to know there are nine restaurants to choose from! Just a few of the examples are fine dining at Vic & Anthony’s, legendary Gulf seafood from Landry’s Seafood House, and casual 24/7 options at Claim Jumper. Their extensive, Vegas-style buffet even offers hand dipped strawberries! 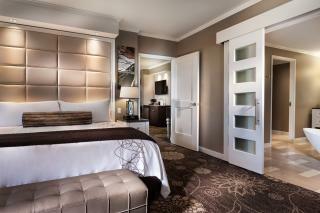 King Room by Landry&apos;s, Inc.
There’s a lazy river with a water slide, along with a marina and private beach. Golden Nugget has already booked top name entertainers for the first quarter like LeAnn Rimes, Meryl Haggard, and Alabama. Although Golden Nugget Lake Charles is the fifth Golden Nugget property by Landry’s, Inc. chairman, CEO and sole owner Tilman J. Feritta, it is really the flagship since this $700 million resort is the 1st resort they built from the ground up. But golfers hold tight. The 18-hole championship golf course, the Country Club at the Golden Nugget, is set to open at the end of April just in time for the start of summer. Find more information on the area’s four casino options at www.visitlakecharles.org/gaming.